2. SAFE & SAVE. USB Rechargeable Windproof, Flameless Lighter, No gas required, no fluid required, energy-saving, and environmentally friendly. a full charge can last up to a week or up to 300 sparks,The lighter won\'t spark while it\'s charging, The lighter also has a safety switch, Keep children safe while lighter charging or not in use. 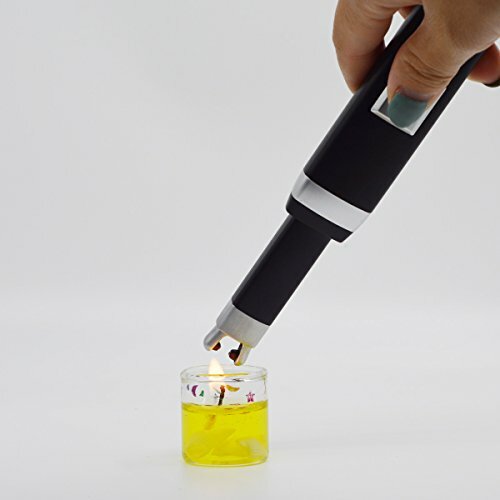 Long handle that allows easily light a candle in a jar, gas stoves, hot barbecue and more. 3. SIMPLY THE BEST.Work like a charm,Just pressed a button and it worked.